Kindle publishing makes it so that anyone self-publish a book and sell it on Amazon. I’ll show you how to validate your book idea before you begin writing, how to set set up a pre-launch sequence, how to properly price your book, how to promote it, and more. If you want your powerful words to be read by millions, you need to make sure there’s an existing audience of millions waiting to read them. No one wants to waste their time writing a book nobody will want to read. Are there similar books? If you can’t find a book similar to yours in the Amazon marketplace, it means you don’t have a good idea (because no one is that original). 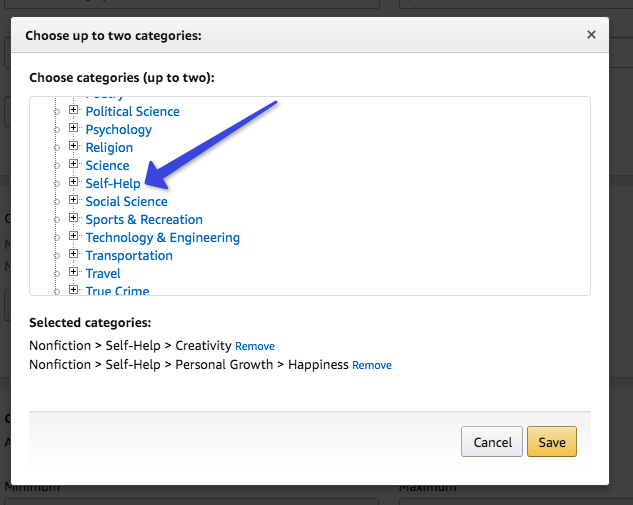 First, you’ll need to find a suitable category for your book idea on Amazon. Go to amazon.com and navigate to Departments > Kindle E-Readers & Books > Kindle Books. Next, click Best Sellers & More in the menu. Scroll down until you see the menu below and click Kindle Best Sellers. 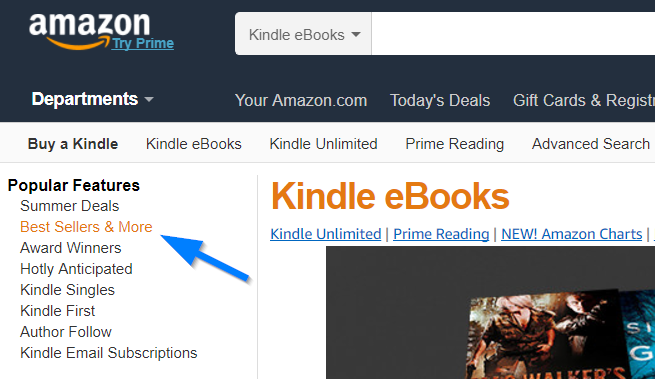 Select Kindle eBooks from the menu. Pick a category and subcategory that fit closest to your book idea. 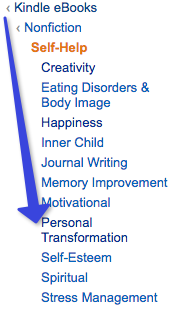 For my book, I chose the category Self-Help and the subcategory Personal Transformation. Once you’ve picked a subcategory, it’s time to investigate your potential competitors. The premise for my book was self-reinvention. 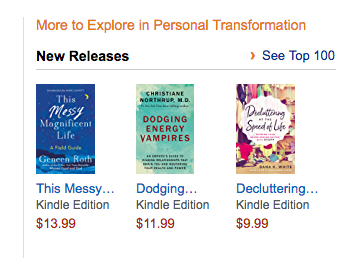 I didn’t need to find a book with the exact word “reinvention” in the title, but I did need to find books with similar themes like behavior change, personality change, and life change. At the end of this step, you’ve answered the first question. You know whether there are similar books to your idea. If you can’t find any similar books, you need to go back to the beginning. Go through your list of book ideas and try again. You won’t find any actual sales numbers on Amazon, but through their “Best Seller” rank you can get a decent estimate. The higher the rank (with #1 being the highest), the more copies it sells — but also, the harder it will be to beat. You have to look for categories where the average best seller rank is neither too low nor too high. Rankings above 1,000 will have great sales numbers, but will be very competitive. As you can see, the sweet spot is in the middle. You don’t want a category that’s too competitive, and you don’t want a category with low sales numbers. Aim for categories where you think you can crack the top three books. If you follow the strategies laid out in this post, you should be able to reach the top three in categories with medium competition. And if you can get your book featured in the top three when you launch, the chances your book will be featured highly in the Hot New Releases list will skyrocket. People browse for books by categories, but they tend to skim through the category pages. 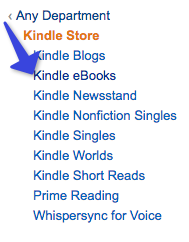 The higher you are in a category, the higher the chance that someone will click through to buy your book. That’s why picking the right category is crucial. If you don’t think you can crack the top three books in your initial category, see if you can feature your book in an alternative category where the competition is less heavy. Final Note: Even if you think you have a great book idea, it’s important to validate before getting to work. Don’t skip this step. A good title won’t make your book do well. But a bad title will almost certainly prevent it from doing well. In short, it’s imperative you nail your title. And to do that, you’ll need to spend considerable time brainstorming the two components of your title: the main title and the subtitle. Your main title should be punchy and memorable. It should hint at the book’s topic, and it should resonate with your audience. For my book, I brainstormed 50 different main titles and 25 subtitles. They weren’t all fantastic, but that’s the point. When brainstorming titles, write down whatever comes to mind. Then review, crossing out the options you don’t like (or don’t like as well). Your favorites will remain. Note: If you already have an email list, I suggest you poll your readers on which are their favorite titles and subtitles. If you don’t have an email list, you can use a polling site like Pickfu. Personally, I hired Happy Self Publishing to create my cover. Their name kept coming up in writing communities, so I gave them a try. I was not disappointed. They struck a good balance of professionalism, quality, and price. Editor’s Note: Author and illustrator Jaime Buckley is another great option. If you’re on a super-tight budget, you might also try Fiverr. Just be sure to check the designers’ samples. You want your book to look professional, not amateurish. I filled out the questionnaire, gave the designer my directions, and submitted samples of covers I liked. We went through several rounds where I told him what I liked and disliked, and he’d send me new mock-ups based on my (and my audience’s) feedback. Eventually, we settled on my final cover. In addition to your cover, you also need to make the inside of your book look good. If all the text is mushed together, it’s full of syntax errors, or it’s written in a terrible font, people won’t want to read your book. I formatted my book myself using an easy-to-use piece of software called Vellum, which uses a simple WYSIWYG (“What You See Is What You Get”) editor. You just copy and paste your chapters into it, change the formatting as desired, and export. A do-it-yourself approach will save you some money, but if you’re not very tech-savvy and want to make sure the book is formatted properly, hire someone. Happy Self Publishing, the company I used for my cover, also provides an affordable formatting service, or you can find hundreds of freelancers on Upwork who can do it for you. When the formatting is done, don’t forget to proofread the book with a Kindle or on the Kindle app. Make sure there are no formatting bugs that need to be fixed. After your title and cover have lured someone to your Amazon sales page, the next thing they’ll do is read your book description. 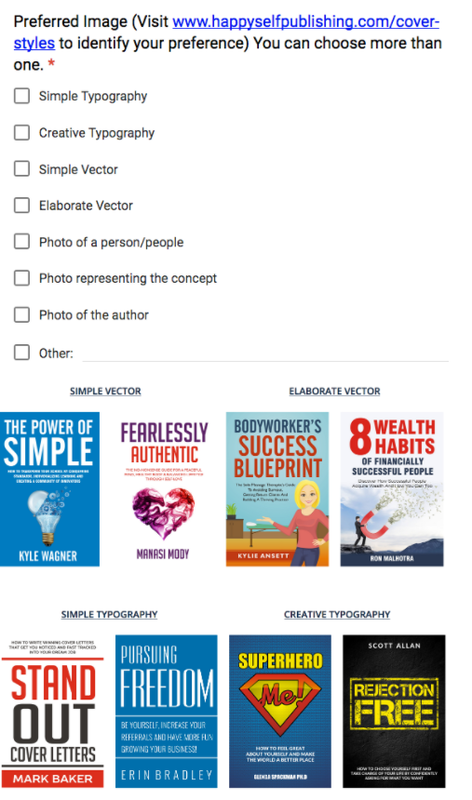 Readers will want to know exactly what your book is about and how it’ll benefit them. If your description is flabby and packed with weak writing, it won’t be compelling enough for readers to click the buy button. Now, the key thing to understand when writing your book description is that you shouldn’t treat it like a summary of your book; rather, you should treat it like a sales letter. Your description shouldn’t inform potential buyers of the contents of your book — it should persuade them to buy. See how I focus the description on benefits to the reader? See how I use the bullet points to foster curiosity rather than give away the main points of the book? These are basic sales letter techniques you should use in your description. Your launch makes or breaks your book. So, you shouldn’t wait until the week of your launch before you start planning it. Instead, you want to have a plan in place and have your marketing materials prepared weeks before you hit publish. Here are a few things you should do to prepare for the launch of your book. Before your launch, you should assemble a so-called “street team” to help write reviews for your book and promote it during launch week. I reached out to people in my network — fellow authors and bloggers I’d met over the years since I started my blog — and asked them to join. 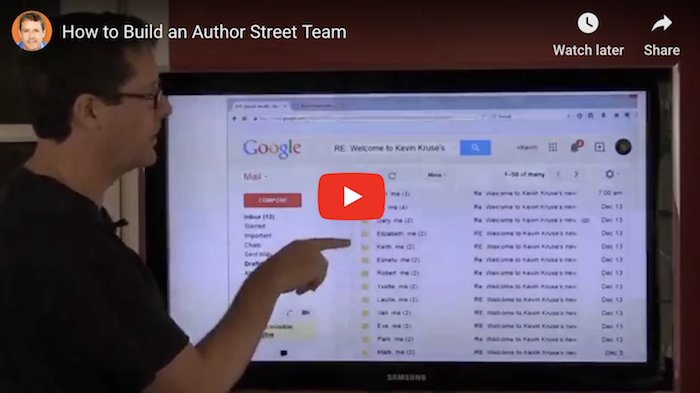 For the number of reviews you want, double that number of people on your street team, because chances are only half of them will actually review your book. At minimum, aim for 25 reviews. This means having 50 people on your launch team. Once you’ve written your book and you can see your launch on the horizon, you want to gently tease your subscribers so they know it’s coming. You need to build anticipation. P.S. I’m finished with my new book, You 2.0.: Stop Feeling Stuck, Reinvent Yourself, and Become a Brand New You. You should never be winging it when you launch a book. If you’re smart, you’ll plan every single step you’ll take leading up to the launch, as well as the days and weeks afterward. You need to create a schedule so you know exactly which promotion happens when, and what actions you should take each day. When you don’t prepare for your launch beforehand, you will feel frazzled and frustrated throughout the launch. You’ll be scrambling to promote the book instead of having a strategy that makes you feel confident the book will sell. 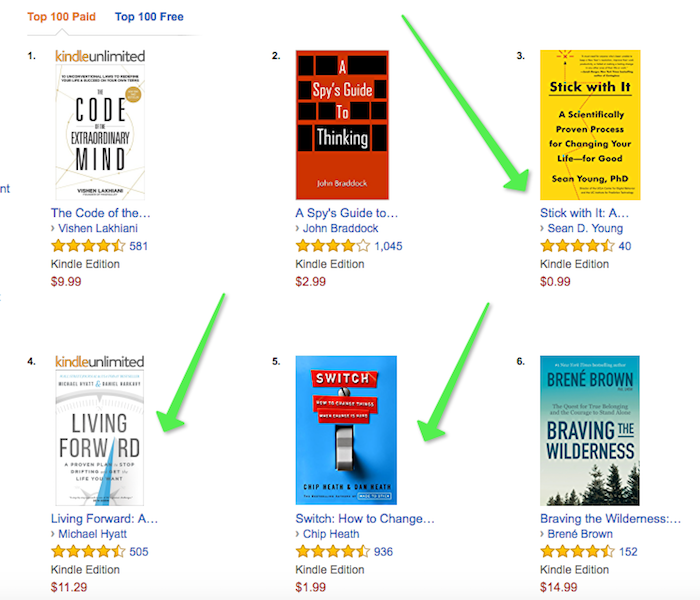 You may think your launch happens when you publish your book on Amazon and put it up for sale. And you’re not wrong. Technically, that is when you officially launch your book. But the launch process is a bit more involved than just clicking a publish button, and it starts much earlier than your official launch. It starts with your first big promotion. That’s when you start selling your book. Below, you’ll find the timeline I used when launching my book. Feel free to copy it, tweak it, and use it as your own. This will give them a taste of what’s inside your book. I sent my own subscribers the introduction to my book, Chapter One, and Chapter Two. Of course, you don’t have to use your first chapters. You can choose to share any chapter you wish. Share the ones you think will make your readers hungry for more. This way, you can ask your street team to write early reviews. These early reviews are important — you’ll need to have at least 10 reviews if you want to use book promotion sites during launch week. Note: You can use HTML tags to change the way the content appears on your book page. 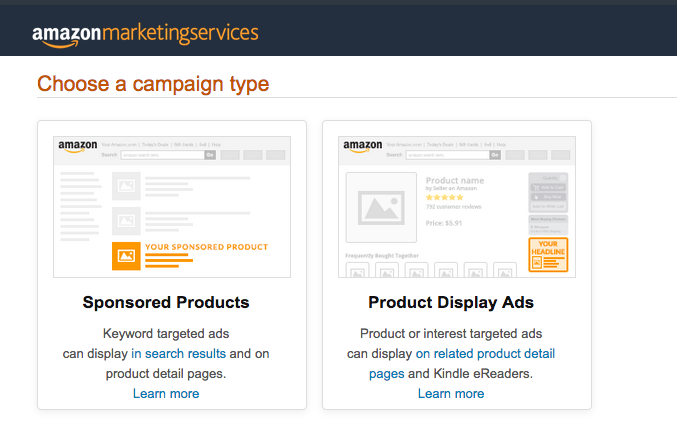 Amazon allows you to use up to seven keywords to help readers find your books. You want to match your keywords with the terms readers will typically type into the search box. 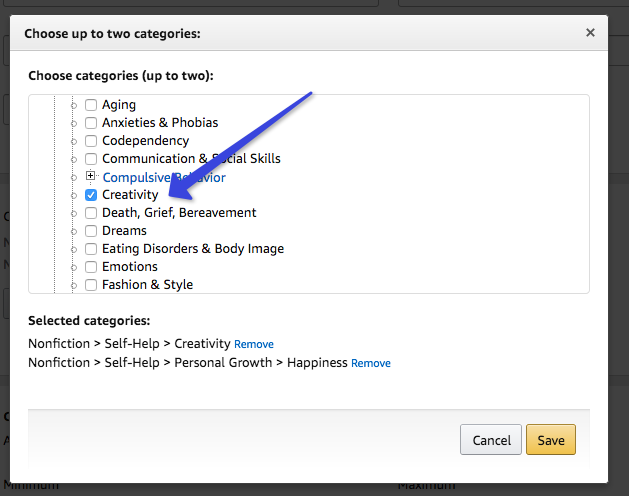 Initially, you’re only allowed to choose two category/subcategory combinations from the list Amazon provides. Strangely, their list doesn’t include all their categories. After you publish your book, browse books that are similar to yours and see which categories they are in. 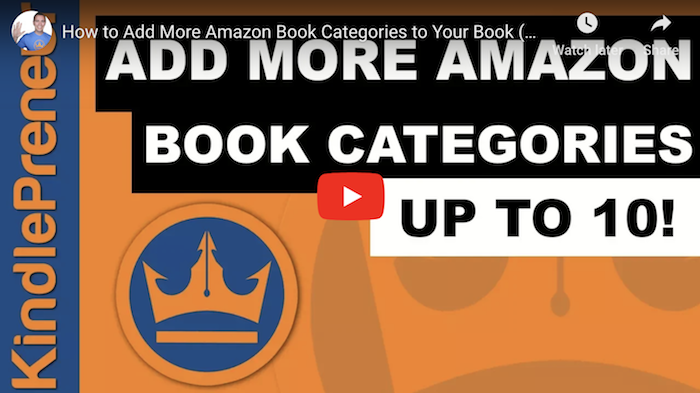 Then contact Amazon and request to have your book added to those categories. But to start, I priced my book at $0.99. The point of this isn’t to make a lot of money early, but to get a lot of sales early. Amazon doesn’t look at the price of your book to determine how well it’s selling. It looks at the number of copies sold. If you can sell a ton of 99-cent copies in the beginning, you’ll benefit from some algorithmic momentum even after you raise the price. Plus, when you price the book at $0.99, you can use promotional sites to get your book in front of massive audiences during launch. (You can also give your subscribers an incentive to purchase early — before you raise the price). When you’re self-publishing books on Amazon, whether they’re written by you or a trusted ghostwriter, those first few days are critical. This is where your street team comes into play. If you’d rather not ask them to pay $0.99 in order to leave a review, you can enroll in “KDP Select” and run a free promotion for 72 hours. That way, they can “purchase” the book for free, and Amazon should still mark their reviews as verified. Now, considering you’ll only make $0.35 per sale on a $0.99 book, you won’t make much profit from the use of these promotional sites. You might even lose some money. So why use them at all? Amazon will promote your book for you if it sees you have sales of your own. When authors make money, Amazon makes money, but like any good business, it won’t recommend products without profit potential. You don’t have to use five services like I did. But use at least three. Do you wish life came with a “do over” button? 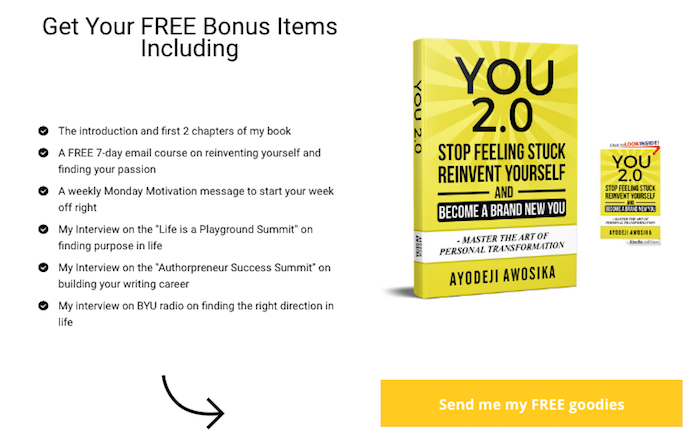 For the past few weeks, I’ve told you about my new book, You 2.0 — Stop Feeling Stuck, Reinvent Yourself, and Become a Brand New You, which is available for 99 cents for the next few days. To make money writing, your book can’t be a flash in the pan. You have to continue promoting the book to keep the sales rolling in. Like I mentioned earlier, you want to give the book a good start with a boost of early sales to benefit from Amazon’s algorithms. But you should keep your momentum going longer than the first week. As mentioned earlier, I set the price for my book at $0.99 for the first week. If I kept sales going at this price, my royalties would continue to stay low. So, after the first week, I raised the price to $2.99, then to $3.99, and finally to $4.99. Every time I was about to raise the price, I sent my subscribers a price change email. This not only reminded casual readers to buy the book, but gave them an incentive to do so. If they didn’t get in on the low price that day, they’d miss out forever, and nobody likes missing out on a good deal. Set up a welcoming autoresponder sequence that gives subscribers your incentive (and then pitch your book to them). You can use the same (or a similar) sales sequence that you used for your launch. 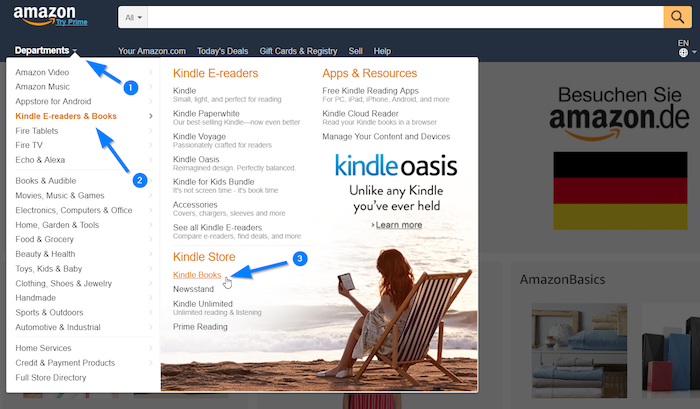 Sign up for AMS through your Kindle dashboard by clicking Ad Campaigns in the top menu. Next, choose Sponsored Product Ads. 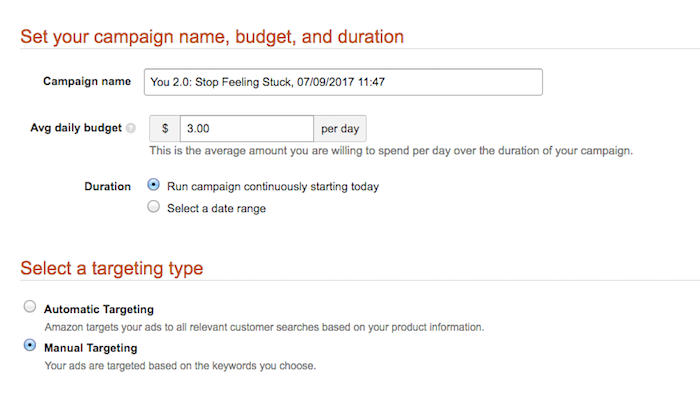 Set your campaign name, budget, and select Manual Targeting. Initially, $3–$5 per day is a good budget because you can get useful data without breaking the bank. Less than $3 won’t give you enough data, and more than $5 can cause you to lose money if you’re not careful. Scroll down to the Add Keywords section and click Add Your Own Keywords. I added 1,000 keywords — the maximum amount allowed per ad — and set the bid at 10 cents. I didn’t want to spend too much money until I knew the type of results I’d get. If the ads worked well, I planned on increasing both my daily budget and keyword bids. Finally, it’s time to preview your ad. If you like what you see, click Submit Campaign for Review. After 24–48 hours, your ad will be live (if it’s approved, of course). After publishing your ad, let it run for two weeks. Then it’s time to analyze the data. You can click into the campaign itself to see these same metrics for individual keywords. Use those metrics to adjust your campaign. For instance, when you see a specific keyword is costing you more than it earns, you can pause that keyword. Alright, we’ve covered a lot here. 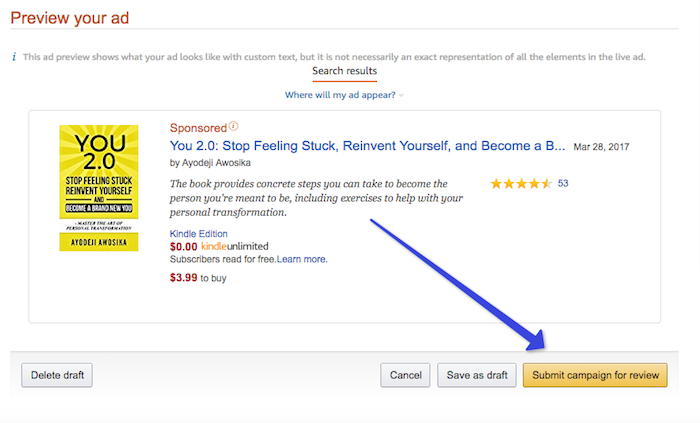 Do I Need an Established Audience Before I Can Self-Publish on Amazon? That’s not a result worth bragging about, but it was enough to inspire me to write a second book and do much better. So, for my second book, I was much more strategic, grew my audience larger, and promoted the book a lot more. And this time around, I got to $1,000 within the first month. You can make money writing even if you have a tiny list, and even if you take a somewhat passive role in promotion. 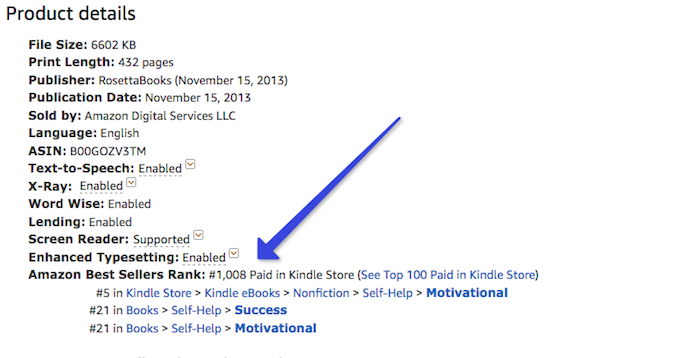 What Can I do to Grow My Audience Before I Dive Into Kindle Publishing? To be honest, I cheated a bit here, because I offered something that I already had available. 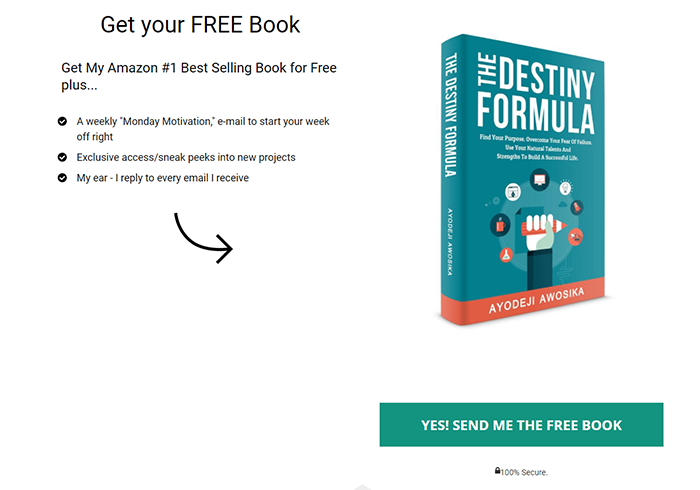 I offered my first book, The Destiny Formula. But I didn’t stop there. I also guest posted on Huffington Post, Thrive Global, Addicted2Success, Thought Catalog, The Pursuit, and more. It’ll make things a lot easier. How Can I Come Up With Ideas For My Own Book? One of the worst mistakes you can make when self-publishing is picking a topic you know little about. If you don’t have a concrete idea in mind yet, don’t fret. Once you complete your inventory, review it to look for patterns. Maybe you’re a great communicator. Maybe you have excellent financial habits. Or maybe you have a knack for motivating others. The traits, knowledge, and skills you possess can be translated into topics for books. Review the list and use your answers to come up with a few book ideas. Are You Ready to Dive Into Kindle Direct Publishing? You now know how to validate your book ideas, package your book, create a pre-launch sequence, launch your book, and promote it. You now know what to do and when to do it. 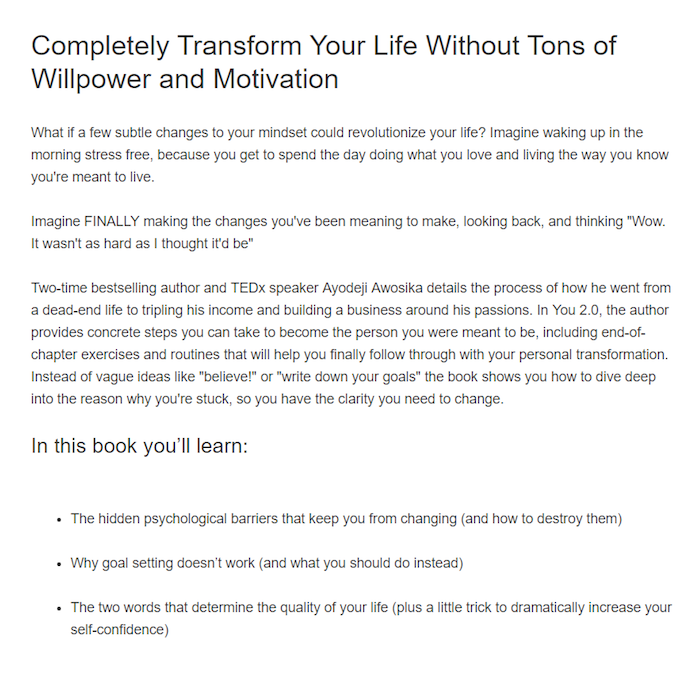 You now have a proven blueprint you can follow for writing a bestselling book. So, there are no more excuses. It’s time for you to join the ranks of bestselling authors. It’s time for you to make some real, tangible income as an author. It’s time for you to stop dreaming and start doing.